I have been working on the computer creating digital art for many years now, and came to discover over the course of time, when scanning my magic lantern pieces into the computer, that they were made for computer exhibition! The inherent light box quality of the computer screen really lends itself to viewing these pieces in the energy in which they were created. This piece, from that series has many of my familiar icons in it and a direct reference to Lucifer, the angel with the bad rap from the Bible. In Christian mythology Lucifer was the Light Bringer. He had the audacity to challenge God. The meaning of the word Lucifer is "light bringer" from 'lux' and 'fer', luminous, shining as in lucid, from the same root word. Lucifer is also referred to as the morning star, Venus and only later came to be associated with the Christian devil. 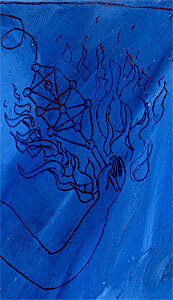 The figure here is dancing in honor of the Beloved, the Creator, whom he loved so dearly. There are many traditions where it is considered healthy to question authority rather than serving in blind devotion. It is in that spirit that I offer this piece as bringer of light to earth, in the form of this "fallen angel" who chose to set an example of independent thought and expression through love of the Divine. This version of Lucifer has much in common with the Romantic figure of Prometheus, who fought the gods to deliver the divine spark of fire to human beings, and suffered much in consequence. 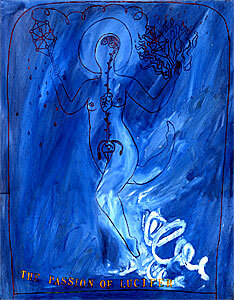 This androgynous figure holds a tree of life icon in his right hand, connected through a line of energy to another tree of life form that is ON FIRE in the left hand. The left hand is symbolic of receiving, and this picture indicates that my Lucifer here still receives the inspiration of God and sends out the balanced forces of Light to the world from his right hand. "In the Bible and the Koran, Lucifer would not bow down to Adam at God's request. The Bible says this was pride, and the Koran says this was because Lucifer loved God so much he would bow down to no one else. Lucifer did not agree with God's elevation of human beings to share the place next to God. In his refusal, Lucifer rebelled, separating himself from the Divine Plan. This was his original sin. Lucifer then tempted Adam and Eve with the fruit of dualistic consciousness symbolized by the fruit of the tree of good and evil. Adam and Eve co-operated with the Divine Plan without thinking or making a choice, it was just their nature to do so. The same was true of the angels, prior to Lucifer's rebellion. Once they ate of the forbidden fruit, Adam and Eve set foot on the path of conscious human evolution. They would have to work strenuously to overcome their dualistic egocentric personality consciousness and return to the undivided unity of Divine consciousness that was their original birthright. God, in his goodness, dispensed his only son Jesus Christ, and other spiritual Masters, to help humanity in their evolutionary journey. As human beings successfully achieve Self-realization and unity consciousness, they transcend the station of the angelic hosts, because they have made a conscious decision to join their hearts, their minds, and their wills with the Divine Plan. Ironically, Lucifer's rebellion set the stage for the drama of human evolution that would allow Earthly beings to transcend their angelic counterparts. And now, Lucifer can only return to God by following the example of the human beings he once despised, rejecting his rebellion, and returning through conscious choice to Unity with the Divine." This piece was originally made in oil stick on arches paper with bronze powder rubber stamping. The Passion of Lucifer is being offered in a signed, limited edition of 250 printed on 11" x 8.5" archival matte paper. Above, is a detailed closeup and to the right is the full piece.